There are few industries where security is as integral to the success of the industry as in the sphere of banking. In the physical world, assets need to be monitored both in large corporate headquarters as well as thousands of regional branches, ATMs, cash vaults, and data centers. Not to mention the virtual world, where online transactions are under threat from hackers and data thieves, looking to steal either currency itself or the personal information of banking customers. This blog post will focus on some of the ways security cameras and video analytics can provide solutions for the banking industry in all of its physical operations. On a small scale, networked IP cameras can greatly benefit local branches and ATM locations. By serving as a deterrent against robbery, security cameras protect not only the physical assets at the branch but also ensure the well-being of the employees and customers of the bank. 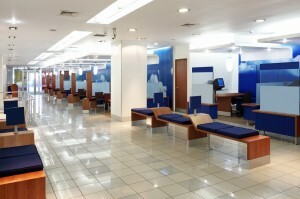 Often, the security feeds from several branches are monitored at one central location due to lack of personnel at individual branches. Networked IP cameras make it easy for centralized locations to monitor branches in real time as well as collect data and store it for analysis. An example of when this might come into play is in the case of fraud investigation. Because cash deposits larger than 10,000 have to be reported to the government, many fraudsters looking to deposit their money deposit slightly smaller amounts across several branches. Video analytics combined with account analysis can detect these kinds of situations and allow security personnel to react accordingly. Physical security is no less necessary at the larger physical operations of the banking industry, such as data centers and corporate headquarters. Networked IP cameras and video analytics are critical tools in these locations as well. Live streaming to mobile devices allows for seamless coordination among security teams which may be spread out over the grounds of the facility. Threats can be analyzed and dealt with quickly through the use of access control systems and intrusion alarms, protecting data centers, vaults, and employees. This entry was posted on Thursday, February 6th, 2014 at 2:52 pm. Both comments and pings are currently closed.